Hi! Some of you might already be going back to school, but I still had holiday this week. Next week it will, however, be my time to go back to school. It was an amazing holiday full of experiences. Today I will be showing you 3 different back to school outfits. Each outfit in a unique style so there is something for everyone! In this first outfit I let the colors of the backpack make their return in the shoes. For the rest I kept it quite basic with a grey shirt and black skirt. This outfit looks edgy, but girly at the same time. This outfit will be so chic for school, but still appropriate and playful. The striped shirt and white jeans are actually pretty casual, but with a leather bag, blazer and a cute necklace it turns into a fabulous lady like outfit. I really like how this look is comfortable and oh so pretty and girly at the same time. 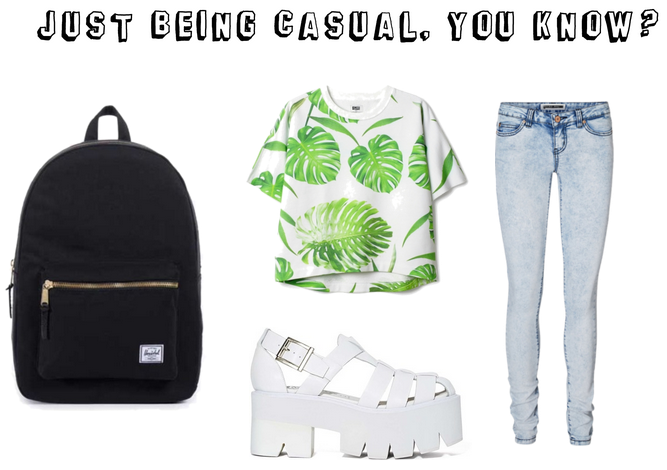 For people who want their outfit to be even more casual, this is how I would style it! A plain black backpack goes with almost all your outfits and I love to combine it with these light items. The shirt has just that extra pop of color and the light wash jeans and white sandals go perfectly with the basic color themes. I hope you liked my outfit ideas, let me know which one you would wear back to school! Love all these, especially love the Herschel backpack!!! Would you like to follow each other on GFC?! Let me know on my blog and follow me, I will follow you right back on both GFC and Bloglovin!